How Much Iron Does Your Baby Need? Iron is an important nutrient required by our bodies to produce haemoglobin. The haemoglobin in turn is a key component of the red blood cells that transport oxygen to the body. Deficiency of iron can lead to impaired growth and development in babies due to lesser oxygen supply. During pregnancy, women are advised to maintain a close check on the iron levels in their bodies as it directly affects the development of the foetus and the same needs to be maintained post-delivery as well. 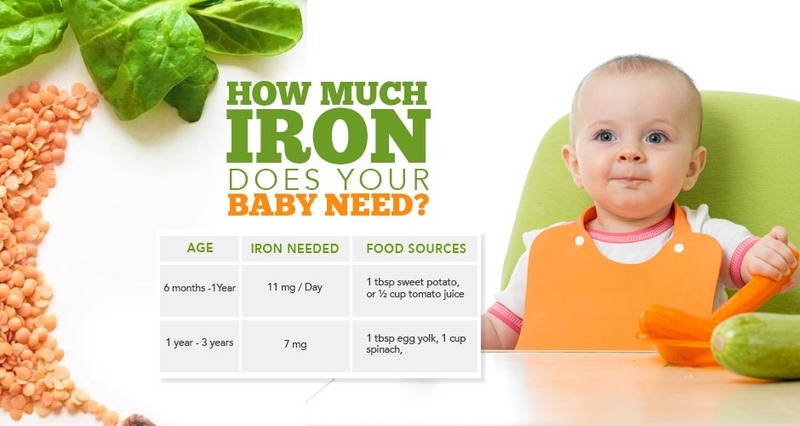 Do you know how much iron your baby needs? It can cause slower growth, or growth retardation. The infant will develop lower immunity levels. The infant may become anaemic. May pose a risk of poor neuro or brain development. The infant may have slower motor skills and response time. The infant may be slow to develop and acquire skills. After birth until 6 months, babies get their iron sources through breastmilk. They absorb the nutrients from the breast milk to meet their requirements. However, post 6 months, there is a rapid growth in the baby and so solid food is included in their diet. During this time, it is very important that their food is iron-fortified. Also, regular check on the little one’s haemoglobin levels are a must to prevent the baby from getting anaemic. 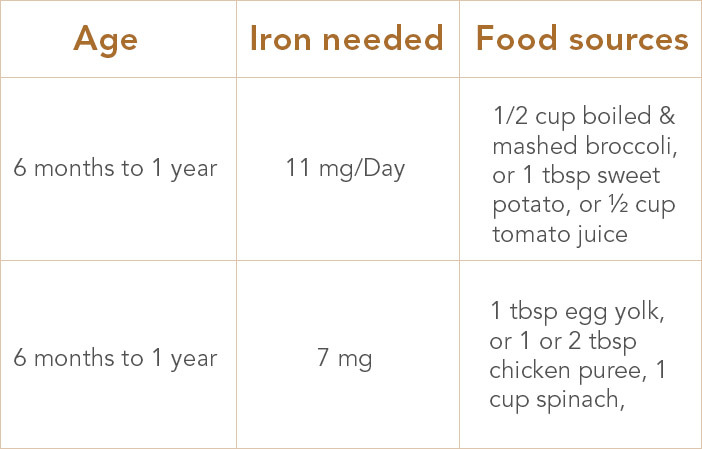 This is an important time to understand how much iron your baby needs. Fruits – apricots, dates, pomegranate, prunes etc. These can be pureed or juiced for babies. Meat not only provides iron but is also a good source of protein, fat and zinc. It is always advisable to initially give only soups between 8 to 12 months, followed by pureed meat for the baby. Along with iron rich foods, it is important to add vitamin C foods in the diet as well, to aid iron absorption. However, combining dairy along with iron should be avoided as it might hamper iron absorption. Does excess iron have an adverse effect on the baby? Iron is added to the baby’s diet to make sure the baby is protected against anaemia or any other illnesses. As much as iron is required by the baby, excess of it can also hamper the growth and development of your little one. This was highlighted in a study done on infants through their various developmental stages up until the babies turned 10 years old. Upon testing the kids across parameters such as thinking, coordination, and memory retention, the researchers found that the cognitive and motor skills of the high iron group were underdeveloped, compared to their low iron group counterparts. Even though the study was based on a smaller test group and the conclusions are not precise, it is advised not to give iron supplementation to infants unless prescribed by the doctor. Moreover, the body’s ability to absorb iron decreases when the storage levels go high. This is a natural mechanism of the body to prevent toxicity. Therefore, it is not advisable to provide excess iron supplementation to the baby. Unusual cases of Hemochromatosis where the body absorbs iron too quickly can also lead of excess storage of iron in the body. According to the leading research institutes like NCBI, infants up to 6 months of age, with normal birth weight should receive an infant formula with an iron content of 4 to 8 mg/L. Finally, never give iron supplements to an infant without a doctor’s supervision and advice.